BB Wolf is a farmer by day, blues singer by night. Life is hard, but he is content with his life until Mr. Littlepig shows up and demands his land. Through a loophole, Wolf and his family could lose his wife’s family farm and their livelihood. Enraged and hopeless, BB shares his story with a friend who gathers forces to defend his land. When his family is attacked and killed, BB goes on the attack and finds himself sinking deeper into alcoholism, the blues, and vengence. In a fascinating reversal of the Three Little Pigs story, Arnold and Koslowski present a harrowing tale of racism, murder, and revenge. In their story, wolves are oppressed by pigs due to species differences mirroring our own history of slavery and racial oppression. BB’s murderous spree is bloody and graphic, but no more so than in comparable superhero comics. The historical context is key, and this is most appropriate for adults and mature readers who have studied the very real history of racism and violence in the United States. 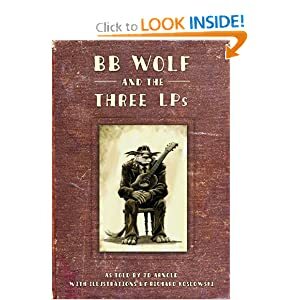 The final pages of the book are filled with notes regarding the story of blues legend Barnabus Benjamin Wolf whose own story inspired this graphic novel. This is an excellent piece for companion reading to historical works about the subject, especially in book club settings where conversation is sure to be sparked.